Many Chinese artists complain that their system of education is overly focused on copying and reproducing artwork until it reaches perfection. In contrast, young artists from the West go to China for exactly that reason. They are looking for discipline and a counterweight to the freedom and lack of structure they encounter in many art schools in Europe and in the USA. Charlotte Nordin, a young Swedish ceramist, based in Switzerland, went to China this summer to meet traditional ceramists in Tangshan and Jingdezhen. Jingdezhen, known as China’s “Porcelain Capital,” produced the royal porcelain for the Yuan, Ming and Qing Dynasties. Limoges in France will create a ceramics studio in the city of Jingdezhen in the spring of 2011. It is also there that Ai Weiwei produced the millions “Sunflowers Seeds,” the porcelain specks that recently caused all the hubbub linked with the exhibition at the Tate Modern in London. 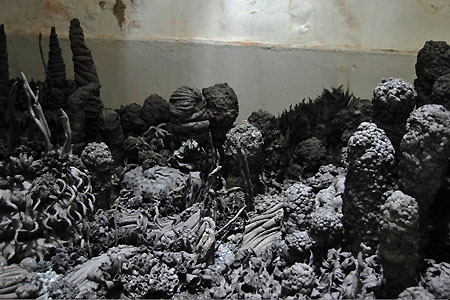 At 27, Charlotte Nordin has already won several awards, including the prestigious Prix de la Relève at the 20th International Biennale of Contemporary Ceramic of Vallauris (in the South of France) for her installation Unknown Forest. Picasso lived in Vallauris and produced most of his ceramics there. Charlotte Nordin also received the Prix de la Ville de Nyon, Switzerland, in November 2010. 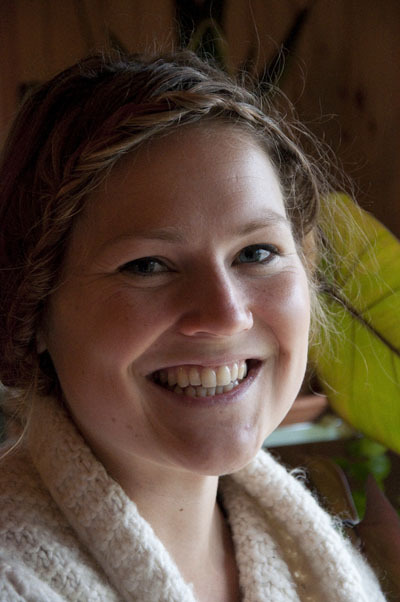 We recently interviewed Charlotte Nordin in her new studio in the town of Trélex, Switzerland. We were interested in seeing how China had affected a promising new western talent who wants to link the learning from the past to her future work by crossing cultures. What do you mean when you say that ceramic work is more than an object? To approach ceramics as an objet can be a very good thing at first. When you have your first mass of clay in your hands and you put it on the throwing wheel with your bare hands and you make a shape out of it, it is quite emotional. Your reaction might be “Oh! I just made a bowl!” Then you realize it is there because of the dialogue between the clay and your hands. Your hands are the expression of you but the clay has its own expression as well. So, it always goes the way it feels it is going to. There are many ways to use ceramics, but depending the way you use it, the way you are modeling it, it does not have to be an object. It is something that happens, that does not really belong to you; it is also the way the clay is responding. Where did you get your taste for the earth? I have been asking that question myself a lot. I went to different art schools before I did ceramics. I did drawing, which I suppose a lot of people do. I was always getting a little bored by it. It was not that that makes me shiver, so to say. When I found ceramics, I knew that was my material, there was no question about it. Did some people influence you? The main influence is the clay itself. I remember what was said to us in school about what has been done historically with the clay. I was very attracted to what the Japanese were doing. If you make a comparison between what people do in China and in Japan, the Chinese want to be the masters of the clay, they want to make it exactly the way they want it to go. They make such perfect shapes and amazing glaze such as celadon, which is technically perfect and very complicated. The Japanese go in another direction. They want the clay to have its own life. They have shapes that are not necessarily perfect. They have glazes that drip a little bit. When I learned the difference, I was more touched by this side of the ceramics, “pas trop rangé” (not too perfect), because I was pretty messy myself. But ceramics is a very rigorous technique as I realized later. The Chinese put a lot of attention into one piece. This allows you to put your soul in one piece also. It is a very general idea but from the impulsive way of considering ceramics and letting the clay live, I am now going into this slow Chinese way of getting better. Was this your main reason to go to China? I did not think I would be so amazed before I went to China. The main reason I went to China is that I feel that we have lost so much of these old ways of looking at the material. No one really teaches you in art schools here to look at the material, to see it, to try to understand what it is telling you. I think that is something I found in the old ways of working in China. I do not know if this is what they are teaching to their students now, but that was the way of the old masters. What I learned about the Chinese way is that they repeat the same gestures as their predecessors made before them. They know they are very humble and they also become very humble about these gestures because they know that art has everything to teach them. Here, in the West, we learn that we should become a great artist; we have something to show to the world. So, we have to come with something new. It kind of destroys it, because you have to keep that in your mind. Of course, you want to do new things and you want to take things that have been done in the past and put a new layer on it, something more contemporary. But, thinking that we are the masters and that we can forget everything that has already been done is really not good. I think that I would not like only to copy the old masters. It would become very boring. But, I think it is something not to completely forget. 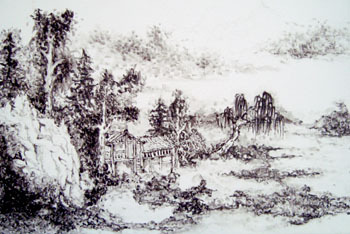 When I was in China, I met this old porcelain painter who took me as a student for a little time. He wanted to teach me these old ways of painting on porcelain. Every day, I came back and I did the same drawing again and again and again. At the end of the day, he erased everything. I thought it was a great way of teaching. He did not speak too much, just simple things like “too much water.” The first time I did a drawing, I thought it was not too bad! At the end, though it was not yet perfect, I could see a big difference between the first and the last drawing. I mastered the lines better. Did you go to China to learn more about the technique or about the essence of ceramics? I was ready to say that it was about the essence, but technique is important as well. I went to Tangshan (Province of Hebei) and to Jingdezhen (Province of Jiangxi). When you go there, you see people only doing ceramics. It was fantastic to look at all these shapes again, because I used to get bored about shapes that are used for daily purposes. I am so involved with installations. I am not proud about the feeling I had, but I felt that these were people who did not realize that there was anything different! In the end, I realized that I was the one who was running too fast; there is so much more in the bowl. My aim before was to transmit an emotion, to put as much of my soul into my work so it can speak to the soul of the person it is talking to. I am not going away from that idea of the soul, but the way you touch your material, the knowledge you have about your material, is also very important to take it a step further. One of my dreams is to go back to China for a longer time and stay with an old master who can break down everything I have learned so far, who can bend it another way. I want to have a broader view. How do you see the fusion between your previous installations and what you experienced in China? Where do you feel you are right now? I must say that I have been very moved by this trip to China. I find it is difficult to work my old ways again. Right now, I am working on a production of vases because I do not have to think too much. It is vertiginous when you stand there and you feel that there is something big that is coming at you and will spin you around. It looks like I have to start all over again. At the same time, I do not have to be too dramatic about it. I have to go step by step and see where it leads me. One of the first things I realize is that I need a pottery wheel! Because I need to go back to the basics. Not long ago, I received subsidies from a Swedish association of women abroad. They gave me some money for a proposal I did to them. It is a big snake. I am phobic about snakes. I thought I have to challenge myself. My first idea was to do different pieces by hand and paste them together. But then, I realized I have to go to the essence of the snake. Making it with a wheel will make me go closer to that idea. The snake has a vibrating movement. On the wheel, I can do cylinders and give them a spin, so it has a rhythm. That is something I have not done before. You never used a pottery wheel for your installations? No. 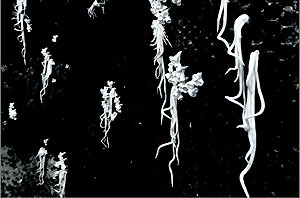 For instance Unknown Forest is composed of plants that I invented by hand. It was a way of playing creator! There are so many mysterious things that happen in the nature, there are phenomena that we do not quite understand. I needed to create my own forest to understand it better. That is the reason why I had to have it in my hand as well. It was very impulsive. No glaze. It was a very quick way of working. Is it the same approach that you used with coCON? I started to slow down there. It is a very repetitive way of working. I did thousands of these little shapes. I could even do that in my kitchen! It did not require a lot of attention. But it was a great period to work like that, to have the clay like that, right in your hands. It took me more than 5 months to do these shapes. I was very calm at that time. We can put that in relation with the copy of the masters in a sense. You have to do the same line and you have to put the vibration of life into these lines. I was trying to put a little bit of life in each of these nodes. This is what you meant before when you talked about the intelligence of hands. There are ways of creating. I have an idea. It is very intuitive. Sometimes, it can be a word that starts to vibrate in my head and I start building on that. There is more information that comes from that first feeling, or picture, or sound. The conceptualization of the whole project will take place afterwards. 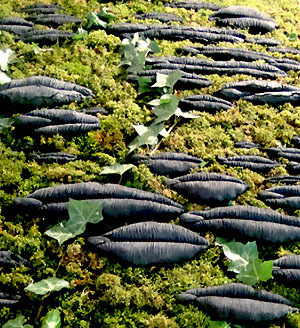 It is interesting with ceramics, because you can finally have a plan around an idea. You touch the clay and, then, you realize that it is not going that way at all. The clay starts to lead you. You have to be humble even if sometimes you get mad because the piece cracks in the oven! What was the purpose of the pieces you saw in China? 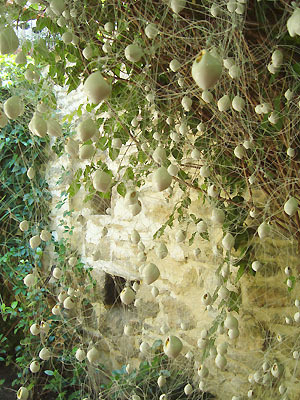 Decoration, practical, only for tourism? What is the level of ceramics you saw there? It is more interesting to talk about Jingdezhen. Because Tangshan is very industrial. All the pieces you see with the label “Made in China” are done there. There are big companies established there. In Jingdezhen, everything is hand made. There are pottery studios everywhere. I was walking there one day and I saw four men working on a big bowl. 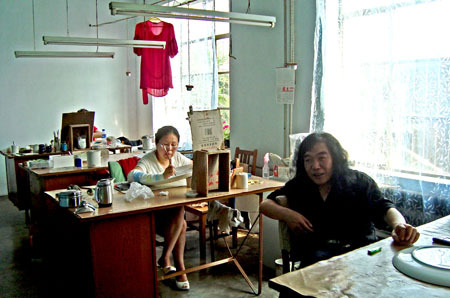 The manager of the studio welcomed me, although the craftsmen were not too happy, because they see too many tourists. One of the craftsmen put two big piles of clay, one on top of the other one, he centered it, he opened it and here it was…a bowl made in maybe 8 minutes. It is absolutely crazy. But he repeated that with another bowl, and another one. In one morning, he did 20 bowls. No one in Europe has the skill to do that. I do not know any one. I have a friend, for instance, he lives in Bern and he is a traditional potter who works at traditional burned potteries. They do not burn like that, not like the Chinese. We lost that, because we do not have these big ceramics industries. So, going to China was like seeing what happened in Europe a long time ago. 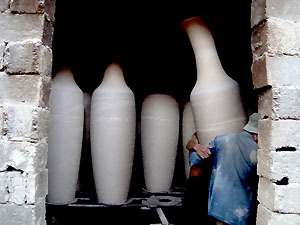 The big traditional jars are made in Jingdezhen. They do the bottom, then the middle, and then the top and then they put the parts together. The tasks are often split. No wonder they become perfect in what they do! It is a question of repeating and repeating over and over again. The pieces produced in Jingdezhen are sent all over the world. Do many westerners come to Jingdezhen to be behind the wheel? It is happening. 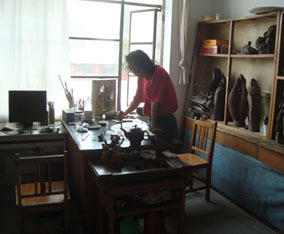 There is the Pottery Workshop, an artist residency, which was created in 2005 by Caroline Cheng. The main one is in Jingdezhen. There is another one in Shanghai. She has a boutique in Beijing too. This is a place where international artists come to do clay, maybe for the first time, or because they have an idea of a production they want to have made. I met a Dutch girl there, who spends 6 months in Jingdezhen, and then she goes back to Holland where she promotes the work that was done in China –not by her but by a studio. Are the Chinese worried that you copy them? It is rather the opposite. People are afraid that the Chinese copy them! Most of the people are saying that the quality is going down in China because it is becoming a mass production. Have you met younger Chinese ceramists moving in the direction of contemporary art, doing installations for example? There are still simple people who work there. The time of the traditional masters is not over. The industry is in China and as long they can make money from it that is fine. I do not think that people are loosing traditions in Asia. There are great masters in Japan and in Korea. Ceramics sticks in the ground in Asia and in people’s minds. People were already collectors during the Ming Dynasty. Ceramics is also linked with drinking tea. The cup is not simply a bowl. It should be perfect to welcome the tea. Absolutely and everyone I met in China is aware of that notion. The bowl is an image for the universe. This is something that they all know. They have all sorts of clay with magical names like “Starry Sky.” It is a great ceramics culture. If you say “porcelain,” people do not know what you are talking about, but if you say “China Clay”, they all know. The reference is there. You arrived first in Beijing. What was your impression of the city? The first two days, I was a little bit shocked, I must say. It is so different from what we use to see. The smell, the streets, the crowd, the people, I do not know. Everything. The energies are different. It took me a little time to adapt to that. But, two days is not very long. Then, I started to look at the city. Big avenues, a lot of cars, pollution. But after a while, I realized the charm of Beijing, because when you arrive you do not see the hutongs and the temples. You see the gigantic avenues and the sky that is always grey. I was shocked to see the cheap art there. 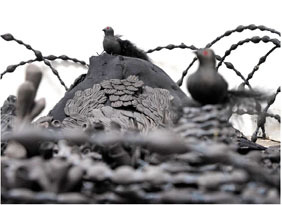 It can give people a very bad impression of contemporary Chinese art. Like plastic pandas. I took some pictures of things I could not believe! These perfect portraits of girls with big butterflies in the hair. To my eyes, it was very kitschy. May be I should not look with my eyes neither. May be they are trying to find themselves too. It won’t be easy, because they were taught not to think for a very long time. And now, suddenly, people are coming to them and telling them that they have to think. From your trip to China, what did you get in terms of new visions, new projects, besides the fact that you want to buy a pottery wheel in order to get closer to the essence of the material? I have a few ideas about where I want to go. Mainly, I know which direction I want to go more than I know what I want to do. I am very thankful for the trip. It changes many things. There is so much for us to learn from the teaching there, from the ambiance that is all over China. There are things I never thought I would be so moved by, so touched. To be honest, I did not know at all what to expect, and all of a sudden this new world opens up. China is very far away from us. Since I am back home, I am reading Chinese literature and books dealing with China. It is opening me up to to that new world. It was a trip for one month, but it has not really stopped yet. I think you get yellow fever.